In order to purchase and download iTunes Products from the iTunes Service, you must enter your Apple ID and password or use Touch ID to authenticate your Account for purchases. Once you have authenticated your Account using your Apple ID and password, you will not need to authenticate again for fifteen minutes on your computer or iOS Device; you can choose to allow your computer or Apple TV to remember your password to remain authenticated. During this time, you will be able to purchase and download iTunes Products without re-entering your password. You can turn off the ability to make iTunes Product purchases or change settings to require a password for every transaction by adjusting the settings on your computer, iOS Device, or Apple TV. Your device or computer will periodically check with the App Store and Mac App Store for updates to the apps on your device or computer and, if available, the update may automatically download and install. You agree that Apple, through the App Store and Mac App Store, may automatically download and install updates onto your device(s) or computer. You can turn off automatic updates altogether at any time by changing the automatic updates settings on your device or computer. When you opt in to the Genius for Apps feature or use Popular Near Me via enabling Location Services, Apple will, from time to time, automatically collect information related to certain of your App Store Products, such as your time spent with each App Store Product and the number of times each App Store Product is launched. This information is stored anonymously and will not be associated with your name or Account. When you use the Genius for Apps feature, Apple will use this information, as well as other information, such as your App Store Product download history, to give personalized recommendations to you. 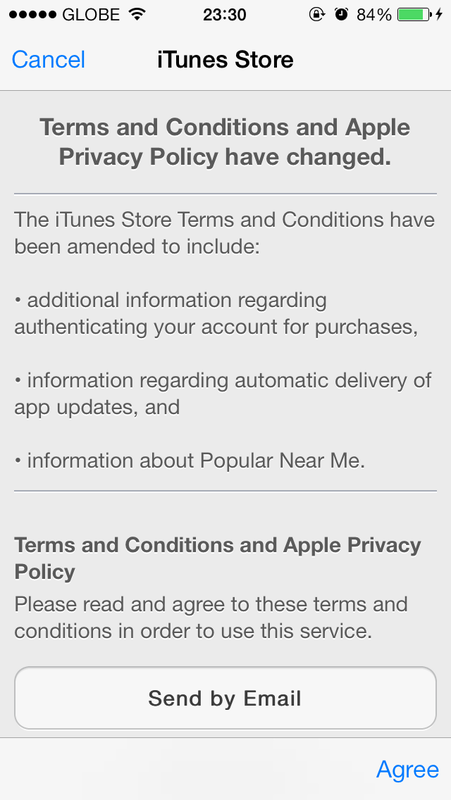 You can read the newly amended iTunes Store terms and conditions on Apple's website. Note that you will be prompted to agree to the updated stipulations before you can complete your next iTunes Store purchase or download.